It has become a tradition that in the fall, my friends would travel to the Red River Gorge area and spend the weekend in a cabin. We would adventure, go out to dinner, and get caught up on each other's lives. The weekend getaways in the past have been full of hiking, zip lining, and kayaking, but this year was something new. It all got started in early October after a meeting between the a few members of the Beattyville/Lee County Tourism Commission and a group leaders of different four wheeling clubs including Aaron Roddey of the Ohio River Four Wheelers, Curtis Caldwell of Eastern KY Offroad, and Jeremy Robbins of Kentucky Krawlers at Hollerwood Park. Together we were able to create a promo video for the upcoming SFWDA 3rd Annual Meet and Greet Ride which was planned on November 3rd. The group leaders invited us to attend the ride the following month. The event was the same weekend we had planned to have our girls weekend at a cabin called Monkey Business. My friends and I decided it would be so fun if we could join the event and go off roading that weekend. Hollerwood Park Manager, Keith Mason and Curtis Caldwell with Eastern KY Offroad, asked around to see if anyone had space in their vehicles so that we might able to go and take photos, videos, and give a unique outsider's perspective on the ride. A few days before the event Luke Bogner with ECO-OHV came through with a van so that we would not only be able to go on the ride, but also ride together. To be honest, when Luke sent over a photo of the van I was skeptical of its abilities. Talking on the phone with him the night before, I warned him that we are a bunch of loud silly women when we get together and that he was in for a long day. He said he was looking forward to it and would make sure we had a great time! On Saturday morning, we arrived at the Natural Bridge Campground and looked around. The place was packed! There were all kinds vehicles going through inspections and getting lined up in groups according to their difficulty. The registration looked well organized and efficient. We wondered through the crowd of rigs to the front of the line, where we spotted the van and finally meet our driver Luke. It was still 30 minutes until time to roll out, so we walked around checking out all the rigs. There was a driver's meeting to attend, where we listened as Aaron Roddy talk to everyone about being courteous, respecting landowners, staying on the trail, “Leave No Trace”, no playing around in the creeks and other important items such as no drugs or alcohol. Aaron did a wonderful job of thanking each of the sponsors and everyone for being there. Once the meeting was dismissed and the drivers head back to their rigs, many stopped to take a look at the van. We all climbed in in the van and other drivers were telling us to be sure and bring back Luke in one piece. It wasn't until we were situated safely in the van that he informed us that it was once a prisoner transport van and the doors could only be opened from the outside! Another drawback is that none of the back windows opened either. We were laughing before the wheels even started rolling. The first part of the journey was an interrogation of Luke’s personal life (poor guy), the ride and the van. Where did he live? How did he find this van? Were we going to get stuck? Most importantly, where did he find the Sasquatch air fresher hanging proudly from the rear view mirror? He did a great job talking about how there were two hills that he was concerned about, and even managed to show us video on his phone of the hills he was talking about. Once into Estill County we turned up the hill from town toward the furnace loop and then went up and up and up (and up some more). The views were spectacular and the road went from blacktop to gravel to mainly dirt. The van really did well on climbing up the hills with 7 people in it. We stopped at a beautiful forest road and hiked down to Tucker Cave. The leaves on the trail were slippery, but the morning sunlight coming through the trees, the mossy boulders, and the spectacular views had everyone in a great mood even though it was still a little cool. The hike down to the cave was short and the cave itself was fascinating. A trickle of water came out of the cave and dropped down a solid cliff wall onto the moss covered rocks below. There were natural steps you could climb granting access to the cave entrance and allowing one the opportunity to look around inside. Once back in the prison van we bumped our way down a steep ridge and up another steep ridge. Over the radio people in the convoy behind us were asking Luke how his "prisoners" were doing. 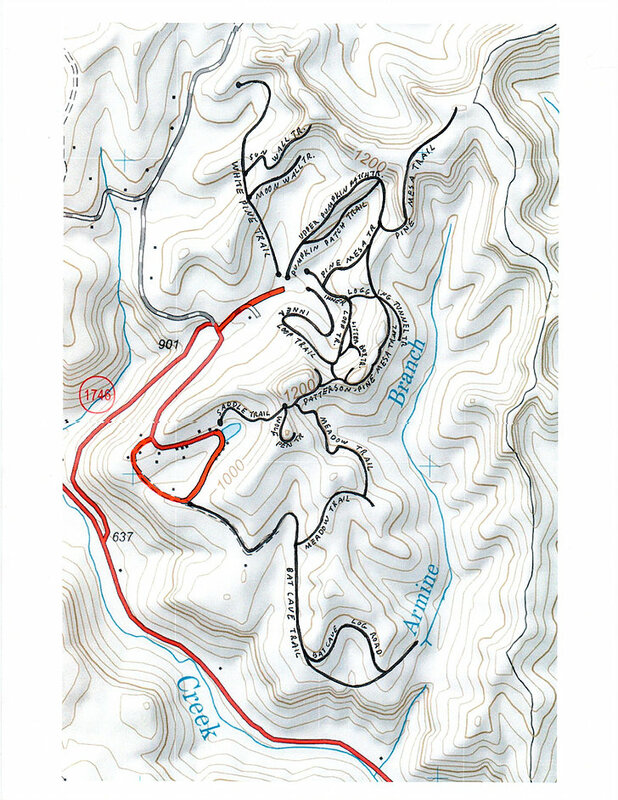 The first obstacle was a rocky, muddy, uphill road with a switchback at the top, followed by a longer uphill climb. Luke radioed Brad, in the Jeep behind us, to take the lead in case we needed a tow. As we started up the hill, I could feel the van's back end slide sideways, loosing traction as it tried but couldn't make it the first go around. Luke put the van in reverse and everyone started laughing. The van had started beeping as it backed up, prompting even more inexplicable laughter. The second try was a success as Luke put the van in second and floored it up the hill. The second part of the hill was rocky and half way up the van got stuck on a rock and wouldn't go any farther. Luke turned the wheel left, then right, then left again, trying to get traction, but it was to no avail. He had to back down the hill a little ways and find a new path. Climbing this hill was like being at a horse race. As the horses turn for the home stretch and the closer the horses came to the finish line, the louder the crowd would cheer. The same was happening in the van, which was christened the White Elephant by this rowdy group of ladies. About a quarter of the way up, then half way up, and again at three quarters the way up, the cheering from the passengers steadily increased until we made it and everyone was praising Luke for this driving skills. We stopped at the top of the hill near an oil well and got out of the van for a photo opportunity. Other drivers were also getting out, and several asked us asking if we had fun, because they could hear us screaming all the way down the hill. Lunchtime was at Bear Track Grocery in Lee County. The store did a great job of making sandwiches and checking out customers promptly. My friends and I ate lunch on the back porch of the grocery store, which has a covered porch built on the cliff’s edge, overlooking the Daniel Boone National Forest. After lunch we loaded back up and went north on New Virginia Road, then turned southeast on Bald Rock Road. We traveled through the Pendergrass Murray and Bald Rock Recreational Preserves and saw multiple parking areas full of cars belonging to rock climbers from all over the US and Canada. Once back on the black top road, we turned toward HWY 11 and headed north back toward Slade. One great things about traveling in groups with CB radios is everyone was aware of what was coming. At one point we passed a group of SXS's, dogs in the road, and another group of rigs. Communicating on CB's made people pay more attention to their surroundings, watch for dangerous obstacles or ensured drives would slow down while passing homes along the way. Everywhere we stopped, the group picked up any trash from the sides of the roads, leaving the scenery more beautiful than when we arrived. It was a wonderful trip full of laughs, bumps, mud, and spectacular views. For the local people who live and go off roading around the Lee, Powell, Estill, and Wolfe Counties, being apart of these off roading clubs would, in my view, be a positive thing. There are rides every month and sometimes every weekend. At every event, you would meet new people from all over KY, Indiana, Ohio, and other surrounding states. Getting involved with the trail repair projects and clean ups also help sustain the trails and roads for everyone who would come and enjoy the beauty of what we have to offer in our area. Here are some quotes from the ladies in the van. Be sure and check out a few photos and video clip of our trip in the big white van. On Saturday, November 3rd 2018 from 8am-5pm the Southern Four Wheel Drive Association, Ohio River Four Wheelers, and Kentucky Krawlers hosted the Third Annual SFWDA Meet & Greet Ride. Clubs such as the Ohio River Four Wheelers, Kentucky Krawlers, and Eastern KY Offroad clubs who ride most weekends in the area invited other members of the SFWDA who to come and ride in the Gorge and experience some trails that this area has to offer, also to show appreciation for all the support that the SFWDA has provided to help develop and promote the Daniel Boone Back Country Byway. Volunteer from several local clubs assisted as guides to different levels of street legal rigs. There were a total of 210 slots available from the easy group which consisted of stock vehicles with all terrain tires to the Extreme group which required 37in tires, two lockers and winch to participate. All rigs must have carried a First Aid Kit and a Fire Extinguisher, also at check in all rigs go through an inspection before being lined up in the riding group they registered for. For the first time this year there were 25 slots made available to SXS’s of the Eastern KY Offroad, a new SXS based group established this year. In a Facebook announcement a few days before the event it was told that all 210 slots were full for the event. This became evident Saturday morning as group leaders headed out from the Natural Bridge Campground in Slade at 9am leading as many as 25-30 rigs per group. 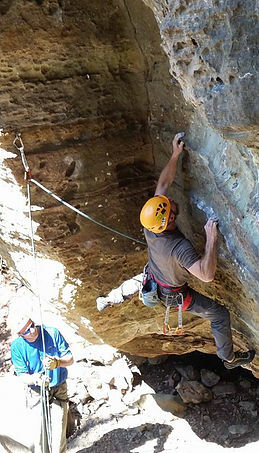 Group leaders took followers to different locations in the Red River Gorge Area including parts of Lee, Estill, Wolfe, and Powell Counties for all day riding along the Daniel Boone Backcountry Byway and at Hollerwood Offroad Park. The Beattyville/Lee County Tourism Director, Dedra Brandenburg and 6 of her friends, from Florida, Pennsylvania, and Kentucky, were able to join the Easy/Beginner group on Saturday. ECO-OHV club member, Luke Bogner, came through with a 12 passenger van for the group of girls to ride in. This van was a repurposed prison transport van with four wheel drive and a long wheel base. Bogner also served as group leader to 20 rigs. The group loaded up Saturday morning and headed toward Estill County to do the furnace loop then stopped at Beartrack Grocery in Lee County for lunch before heading down New Virginia Road, through Bald Rock, and back toward Slade. Learn more about these clubs online through Facebook and the Web. There are rides almost every weekend and club rides such as this promote safety, leave no trace, and tread lightly ethics while also supporting the local economies through the purchase of gas, food, and lodging for the weekend. Economic impact number from this weekend’s ride have not been released but will in the next few days. The following article is from https://kentuckyexplorer.com/nonmembers/KEaprilsample.html it is a very good read about one persons perspective of Beattyville in the 1890's. Beattyville is the county seat of Lee County, which was erected in 1870 out of the counties of Owsley, Estill, Wolfe, and Breathitt, and named Lee after General Robert E. Lee. Beattyville was Beattyville long before it was the county seat of Lee County, having been incorporated in 1845, and named in honor of Samuel Beatty, a pioneer who died there in 1889. It was originally called Beatty, but the feeling, which characterizes some localities that a town isn't a town until it has "ville" stuck on to its name, prevailed to such an extent that it became Beattyville. And nobody knows just when the change took place. When the county was plucked out of the sides of its neighbors, Beattyville and its sister town of Proctor, on the opposite side of the river, forthwith entered into a scrapping match as to which should be the capital, and though the first court was held in Proctor, Beattyville hadn't much difficulty in the final capture of the coveted honor. She has retained it since, and Proctor sits silent on the hill beyond and weeps for the glory departed. But let us not point the finger of scorn at Proctor. When the L & E railway completes its branch down that side of the river, Proctor is going to give a mighty leap into the air and kick its heels high over the hills of Lee in the exuberance of a new birth. The population of the county is 7,000 and of the town 1,200. That is the claim for the town, and possibly it is slightly in excess though the town limits are copious and 1,200 people don't cover much ground when they are bunched. Beattyville is located on the Kentucky River just where it becomes the Kentucky River, that is to say the North and South Forks connect there, and the Middle Fork puts in a couple or three miles above town. It is about eighty miles from Lexington, which puts it about equidistant from Cincinnati and Louisville, and Louisville has the bulk of the town's trade and her newspapers are the only ones taken to amount to anything, the Courier-Journal leading all competitors. It is a town of the sixth class and is therefore not eligible to the high dignity of having a mayor and city council. It seems to worry along, however, very comfortably with a board of trustees and a police judge and town marshal, the judge and marshal only getting paid for it. The courthouse, completed in 1873, is of brick and cost $12,000, which is a little high considering how handsome a building may be put up in these days for that amount of money. I was greatly pleased to note, however, one feature about it which distinguishes it from all the courthouses of all the towns I have yet written about, to wit, it hasn't a clock on its steeple. I thought possibly the clock had run down some night and jumped into the river, but I was reliably informed by Judge Breck Hill, a man of immaculate truthfulness, that there had never been a clock there. The jail at the rear of the courthouse is of brick and cost $7,000. It is new and strong, with all the modern conveniences, but it wasn't strong enough to hold the man who killed Sheriff Simms at the fair last year, though the bridge trestle to which the crowd of indignant citizens hung him during the night seemed strong enough to hold him without any trouble at all. In the matter of church buildings, the Christians, Baptists, Presbyterians, and Episcopalians are provided with houses of worship, while the Methodist brethren have to take to the courthouse. The Episcopal church is the finest in the mountains. It is of stone, of chapel design, and was to have been built for $4,500, but the contractor left it unfinished. It has taken a new start now and may be done before a great while, but a church like that can't be built for $4,500 of anybody's money. It is located on a point of lookout, and is an attractive feature of the landscape. The Christian congregation set its house also on a hill, just across from the stone church, but the spirituality of the brethren was insufficient to lift them to such heights, so they sold the building for $1,200 and built quite a handsome shingle and frame church for $3,000 down in the bottom in a very poor location but without a climb to it. The Baptists are finishing a pretty frame church, and the Presbyterians have one a hundred or so feet higher up the hill. These cost about $1,500 each. The Episcopalians have a regular pastor stationed among them, while the others have to hustle around among their neighbors. We come now to the next best thing to religion, to wit, the public schools, and you ought to see the Beattyville public school building! It is of the rococo, renaissance, Graeco-Roman, catch-as-catch-can order of architecture, one-story high, and never saw a paint brush in its life. In other words, it is something the people of Beattyville ought to be so heartily ashamed of that they would contribute their own money to remedy it if they couldn't get it another way. There are 380 scholars enrolled, with an attendance of 100, and the wonder is that 100 children can be found who would go to school in such a place. I presume the building must have cost as much as four dollars and thirty-seven cents in high times. The schools are in charge of Prof. W.H. Harris, with one assistant, and the pay for all is $900, which is little enough, the Lord knows. There is no fire department, but the bucket brigade does noble service when a fire breaks out. Neither are there any electric lights on the streets. There are street lamps, however, but they are never lighted and when a Beattyville citizen wants to go anywhere after dark he depends on the moon or a lantern. I have wondered sometimes where the manufacturers of lanterns sold their goods, but I know now. Everybody in Beattyville has one, and they bob around at night like a lot of lightning bugs. Beattyville is the City of Bridges, having in her midst six of these useful structures for passenger and railroad purposes. There are no banks, though in the boom days she had a couple. Neither has she any saloons. Still, for a very temperate town, more men seem to have hit the pledge a lick and busted it than any place I have visited in a long time. I fear the wild and wooly blind tiger lashes his tail and tears up the ground in the neighborhood. I am glad to testify that the drug stores don't sell liquor as they do in some local option towns. There are thirteen stores in town, three sawmills, a stream grist mill, and the Avent, the Beattyville, and the Crystal Creek coal companies and several individuals who dig and ship coal. The principal business is coal and timber, and about three hundred carloads of coal are shipped each month. The coal is of good quality and is shipped all over the state. Between two and three hundred men are employed about the mines, and labor troubles are not unknown. Coal sells in town at six cents a bushel, delivered. There are four doctors, and the Riverside Cemetery of five acres is a thriving institution. Fourteen lawyers make an average of from $100 to $2,000 a year, the latter sum being the exception rather than the rule. There has never been a legal hanging, though one man received a death sentence which was afterward commuted to life imprisonment. The one lynching took place last year, when Oscar Morton was hanged on the trestle within a few hours after he killed Sheriff Simms. It was the quickest on record. Feuds do not prevail, but six men have been killed on the streets at one time or another, all of them in personal difficulties, except one, the first man killed in Lee County, Abe Wilson, who was assassinated at night by unknown parties. The postmaster is F.A. Lyon, and he relieved Uncle Sam of responsibility by owning the building the office occupies. He is also a good fellow and looks as if post-officing agreed with him. There is no library nor is there a copy of any of the reading magazines taken in town. Not one, which is more of a reflection on the town than it is on the magazines. The town is also short on Y.M.C.A., and there isn't a club of any kind. It is just as well, perhaps, that there isn't. There are about 300 Negroes and twenty-five foreigners, principally Welsh and Irish miners. The water works are yet to be built and there is no laundry. Lexington and Winchester act in the capacity of washer-women to those residents of Beattyville who affect the hard-boiled shirt and the ironed collar and cuff. Beattyville is at the head of navigation on the Kentucky River, and something like $250,000 has been spent by the government on a dam and lock here, which are now more in the way than anything else. Just why the engineers should begin at the head of a river to lock and dam it instead of at the other end does not appear, though some distinguished politician who worked the appropriation might explain. Socially, Beattyville is the Paris (France) of the mountains, and the youth and beauty love to dance and hold church suppers and boat rides and have a good time generally. The girls are pretty and dress in the latest styles, and are quite fin de siecle in all the little details that go to make up society with a big S. The men wear dress suits on swell occasions, and the stranger in those parts would scarcely realize that he was in a mountain town. There are three hotels in town, one, the Ninaweb Inn, cost $25,000; and as a hotel is the attractive point to visitors in town. I want to say that Beattyville owes more of its attractiveness to the outside world to this hotel than to anything else within its gates. It is modern and well kept, with a commanding location and Charlie Dorman and his handsome wife to see that every visitor goes away with a good impression of the entire surroundings. Of all the towns I have talked about in the Courier-Journal only Beattyville and Richmond are properly equipped with hotels. This is bringing Beattyville to the front as a summer resort. Many visitors came during the past summer to enjoy the good air, the pretty hill and valley scenery, the fishing and boating, and all the other good things nature has given, and they went away to tell the story to others, and come again next year. Kentucky just now is short on home summer resorts, and these Eastern Kentucky mountains are full of charming sites only awaiting development. Beatty-ville stands at the head of the list, owing to her possession of three rivers, and in these the visitor's interest never lessens. The traveler reaches Beattyville over the Lexington and Eastern Railroad, formerly the Kentucky Union, from Lexington, connecting there with Cincinnati and Louisville over the L&N and the C&O, and with all points east over the C&O at Winchester, and with points south over the L&N at the same place as also at Lexington, so that her railroad connections may be said to be ample. I ought to say that Beattyville is seven miles from the L&E over the Beattyville and Cumberland Gap road, a short road opened in 1892, two years after the K.U. gave the town egress other than a mountain road or a trip down the Kentucky River on a sawlog steamboat to Ford, seventy-five miles. The L&E is now surveying a road down the other side of the river through Proctor and on to the great Sturgeon coal fields, which will probably be opened next year. It is twelve miles in length and can be built for less money than the B. and C. G. people want for their road, which by the way, is a paying piece of property just now. When the railroad came within reach of Beattyville in 1890, it precipitated a boom, and the population jumped up from 300 to 1,000 in about fifteen minutes, while the prices of real estate jumped clean over the population. One firm bought 1,600 acres of land for $60,000, another took 1,300 acres for $35,000, and individuals took what they could get at any prices people chose to ask. Fifty dollars a front foot for suburban lots that a short time before could have been bought for $5 or $10 an acre was not thought exorbitant while property in town sold right along at $100 a front foot. Subdivisions with fancy names sprouted up everywhere on the hills and the people went wild. Plain old Main and River and Center Streets were forgotten in Grand Avenue, Pryse Boulevard, Carlisle Avenue, and Lexington Avenue, and Crystal Park glinted like a gem in their midst. But like many others, it failed to hold up and now the dream is over, and the people are standing together to give Beattyville such a foundation that when she rises again, she will stay there. And it looks as if she will get there in good shape, for only recently as much as $780 was paid for an acre of ground in one of the boom subdivisions which cost originally $50. The boom did some good, however, for the population of the town was only 165 in 1887, and now it is seven times as big. The Beattyville Enterprise is the leading newspaper. It leads all competitors, and Brother Pollard claims with consistency the largest circulation in the city. P.S. - There is no other paper. There is no opera house and shows are scarce. There is one bicycle somewhat out of repair and no bloomers. Six typewriters show progress in that direction. Carriages and buggies do not flourish owing to the lack of good roads. The young ladies and some of the married ones are very graceful and daring equestriennes, and they ride good horses. Millionaires are scarce, fortunes ranging from $50,000 down, but everybody has all he can eat and drink and plenty of clothes to wear. The Beattyville fair is the great autumn attraction. I went there to take it in, and I did, making my appearance five minutes after I got inside the gate, as a judge in the pretty baby ring. Fortunately for me only one entered, and I got off easy. The fair grounds are located on a high hill with a winding mountain road leading up to them, and when they have reached a higher state of cultivation they will be large and elegant. Judge Mann was the general-in-chief of the fair, and I'm willing to pit him against any man in the state as a field talker and an adept at saying the right thing at the right time. A committee of ladies awarded him the blue ribbon as being the handsomest man on the grounds, but the committee evidently didn't see Breck Hill or Secretary Phillips or Postmaster Lyon or me, though we kept ourselves in plain view all the time. Caleb Breckinridge Hill is the county judge, and he can tell a story and then tell four dozen more, equal to anybody in the state. 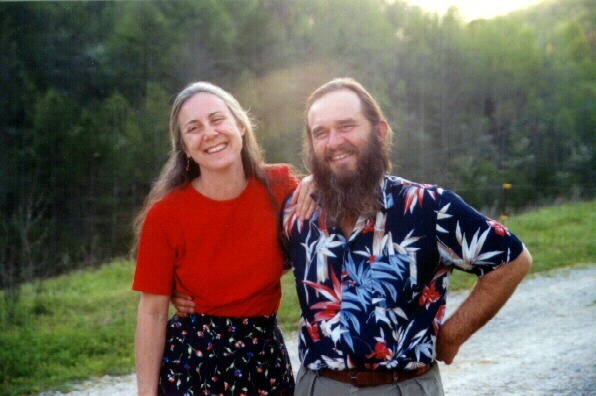 Sam Spicer is another distinguished citizen, and Preston Sloan was in the army for "three years, four months, and ten days" and was shot eleven times. Preston gets a pension for being on the winning side. Beattyville has not yet contributed a national character to the list. One man in the county never wore a boiled shirt, never owned an overcoat, nor wore gloves, never had on a collar but once, and wheat bread makes him "sick to the stomach." Another says he never smoked a pistol nor shot a cigar in his life. Samuel Brandenburg was the first white child born in the county. The only brick buildings in town are the courthouse, the jail, the bank building, and the Ninaweb. The Episcopal church is of stone and wood makes up the remainder, including a number of very pleasant home-like residences with pretty shaded door yards. Now and then a bit of brick or flag sidewalk appears, but there is not as much of it as there will be in future. I omitted to state in my remarks on the educational facilities of Beattyville that the Episcopal rector conducts a school in connection with the church. The building is a substantial one of frame and overlooks all the valley. It is a good thing for Beattyville besides. I may also say that nearly every church has a bell, and the Beattyvillian can't offer as an excuse for staying away from church that he didn't know it was time to go. By the way, I attended a church supper one night, and I found in the soup the beautiful young ladies served us, what is unusual in the ordinary oyster soup of church suppers, to wit, oysters. In this regard Beattyville sets a grand example to all the churches of this country of ours. The location of Beattyville is picturesque in the extreme, and when she has grown to greatness, she will equal Rome in the number of hills she sits upon. At present her scatteredness, so to speak, detracts somewhat from her compactibility. Get your friends together and sign up for our first ever co-ed volleyball tournament in Beattyville, KY along the banks of the Kentucky River. 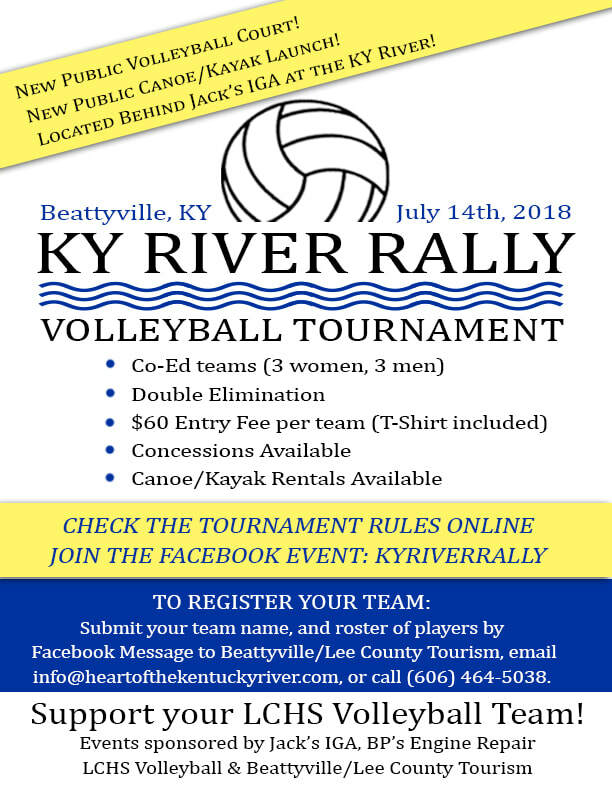 The KY River Rally Volleyball Tournament will be held on Saturday, July 14th. The tournament is for 16 year olds and over. Co-ed teams with 3 men and 3 women on the court at one time. Check out the flyer for more info. Sign up by email info@heartofthekentuckyriver.com, phone (606) 464-5038 or Facebook event page. Proceeds go to the LCHS volleyball team. Background: The Beattyville/Lee County Tourism Commission just installed a new public volleyball net system on grass court that is behind Jack's IGA at the river. Inspiration for the public volleyball grass court came from the Lee County High School volleyball team as they have won the district volleyball tournament two years in a row. 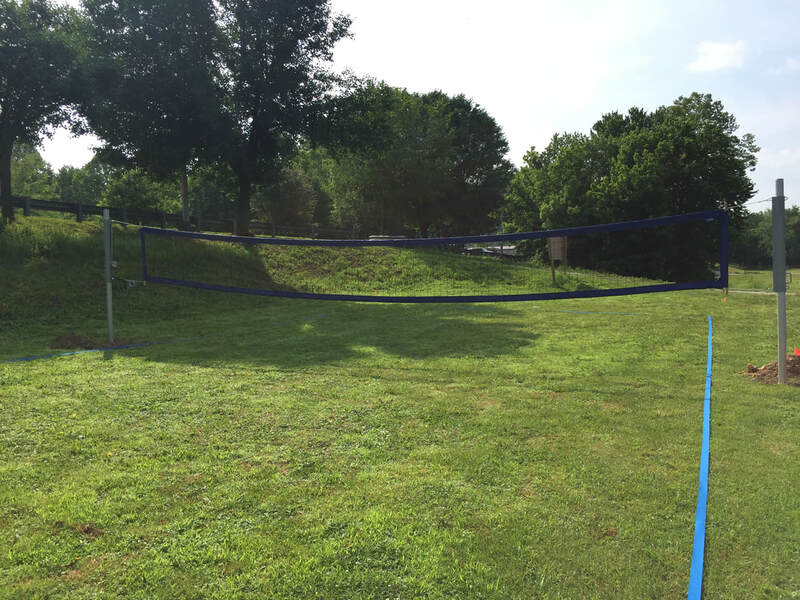 Volleyball is a fun and exciting game for all ages and this new net has the capability of sliding up to 8 feet for men's games, 7 feet 6 inches for co-ed, 7 feet 4 inches for women's volleyball or even slide it down to 4 feet for youth to play. Between games, try out the new Kayak/Canoe Launch on the property. $15 per hour! 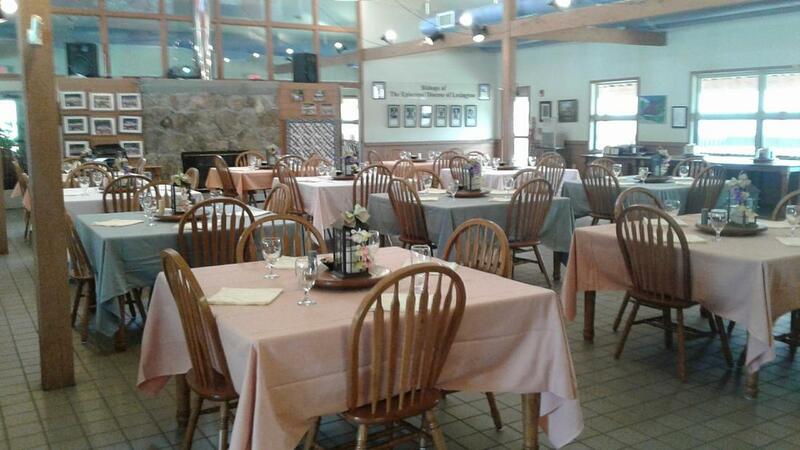 Beattyville/Lee County Tourism annual steak holder dinner. Friday night, (04/06/18) the Beattyville/Lee County Tourism Commission hosted an annual dinner at the Cathedral Domain in order to share information about previous year activities, financials and upcoming plans and events. Lodging owners who own and operate cabins, motels, or bed and breakfast locations in Lee County, along with chamber members and local leadership from the county and city level attended the dinner. The delicious dinner was catered by the staff of the Cathedral Domain, and was served at 6:00pm followed by guest speakers at 6:45pm. Guest speakers included the Beattyville Main Street Director, Teresa Mays who updated the lodging owners and local leadership on new business openings in Beattyville, the progress of the streetscape beautification project, upcoming events for downtown, and more. Following Mays, Mr. John Ott, board member and representative from the Diocese of Lexington, spoke about the history of the Cathedral Domain and how they have recently opened up their 800 acres to the public for hiking and rock climbing. The event served as a networking opportunity as well as a platform for organizational transparency, as the tourism commission director, Dedra Brandenburg, gave an annual report on the previous year activities and finances, along with announcements of new openings and tourist activities. There was a lot of river activity in 2017 for the commission and community. 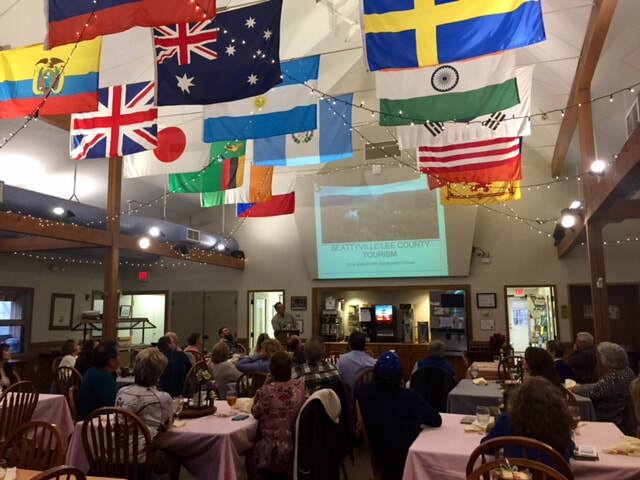 In the spring, the commission showed a documentary about the KY River by Herb Smith at the Three Forks Historical Center. In the spring, the commission also received a $3,500 Brushy Fork Flex-E Grant to do river trail development and have paddle trips over the summer. Over the summer, the commission hosted four paddle trips and had a total of 82 paddlers participate. The commission also partnered with the Area Technology Center who created and installed trailhead kiosk structures with maps of pool 14 along with mile markers of the river trails and access points along the river. 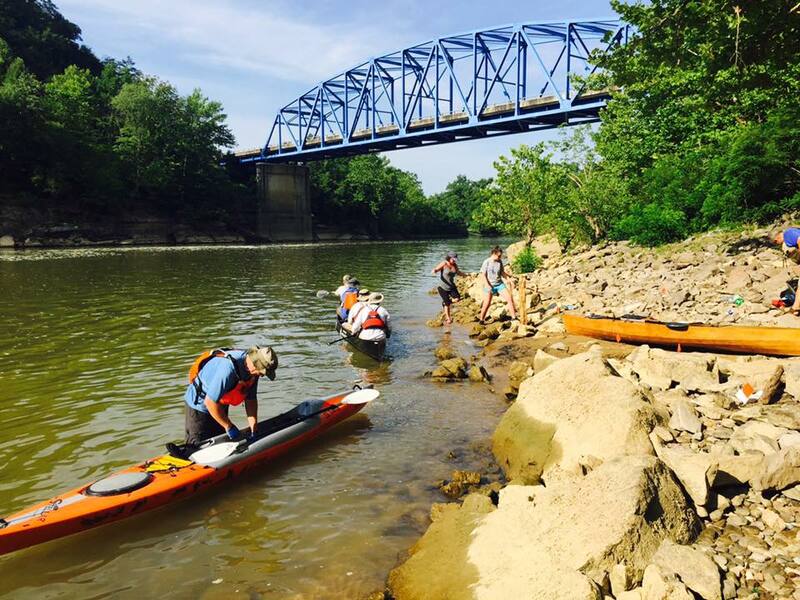 In the summer, 12 racers and their land support crews, participated in the KR255 adventure river race which started in Beattyville and ended in Carrolton, KY at the Ohio River. 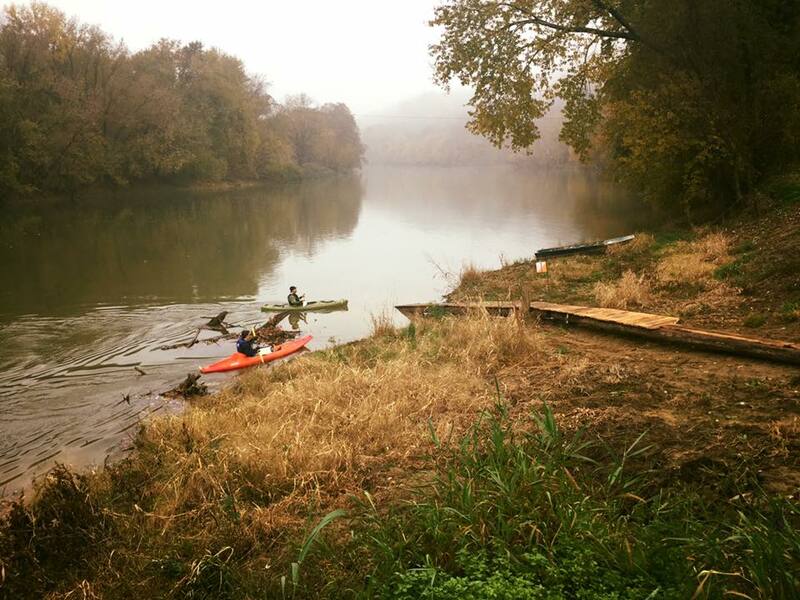 In the fall, there were 115 racers of the Unbridled Adventure FIG Race who used the new ramp at the Canoe/Kayak Launch property located on River Drive in downtown Beattyville behind Jack’s IGA. The property is owned by Jack and Fonda Gross and is leased by the tourism commission and made into a public river access point. Financials over the previous year were very positive to report also. According to the 2016 Tourism Economic Impact Study done by the state of KY, the Red River Gorge region consisting of 5 counties (Powell, Wolfe, Meniffe, Lee, and Estill Counties) grew 2.5% in travel expenditures (gas, shopping, dinning, etc.) from the previous year totaling $24.6 Million. 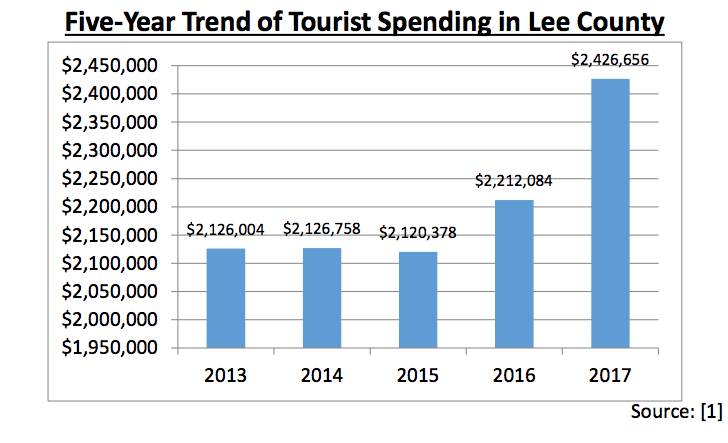 Lee County alone increased 4.3% in travel expenditures in 2016 totaling in $3.74 Million and supporting 114 jobs in Lee County. 2017 numbers will be released by the Kentucky Tourism soon. It was also reported that overnight stays at cabins and motels in Lee County grew 18% from 2015-2016. Over night stays reached a total gross amount of $1,565,000 at the end of year 2016. This number grew again by 13% in 2017. 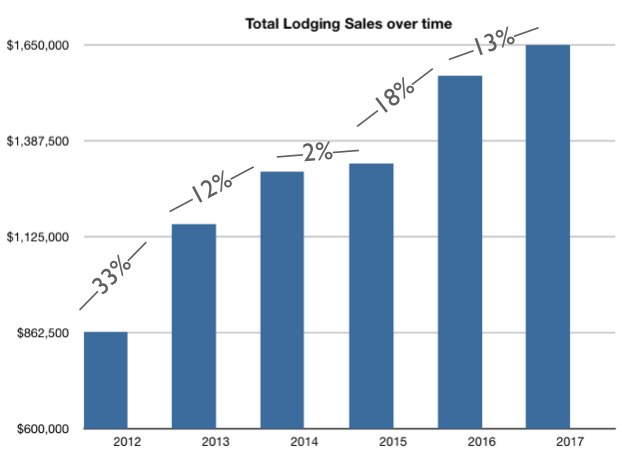 At end of year 2017, lodging sales totaled $1,863,000. Since the tourism commission was established in the fall of 2011, lodging sales has grown an average of 15% per year. ​The Tourism Commission was established a joint ordinance between the Lee County Fiscal Court and the City of Beattyville. The ordinance also created a 3% transient room tax on lodging in Lee County, which funds the commission. The tax is charged to the tourist who visit the area and stay in cabins and motels. The tourism commission took in $55,900 in local tax for 2017. The current Beattyville/Lee County Tourism Commissioners includes Linda Smith, Don Begley, Teresa Mays, Fred Austin, Paul Vidal, Jessica Treadway, and Mike Stamper. 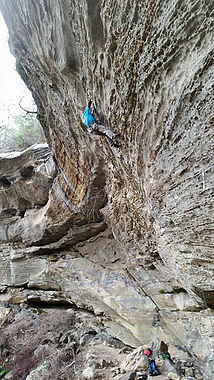 To view all the lodging opportunities, attractions, and outdoor adventures in Lee County visit www.visitleecountyky.com. 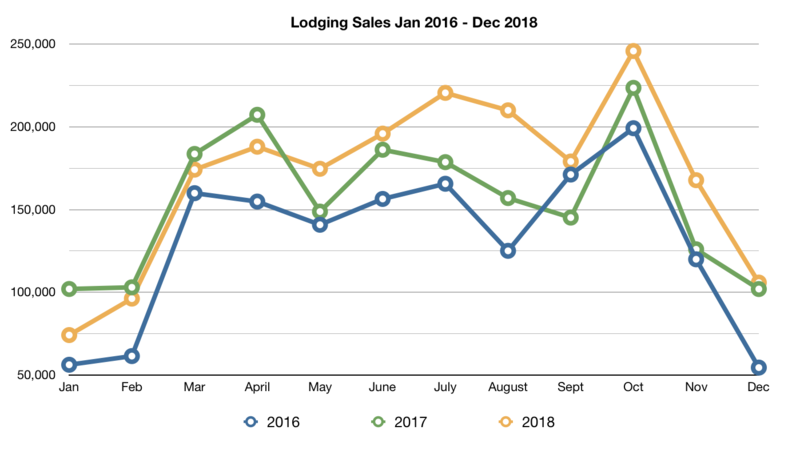 Transient Lodging Sales in Lee County from 2012 to 2017. Cathedral Domain Dining Room, a beautiful location for an event. Unbridled Sprit 12 Hour FIG adventure race participants used the canoe/kayak launch located in downtown Beattyville off of River Drive, behind Jack's IGA. John Ott, of Cathedral Domain talking to the guest about the camp. Photo taken at the Kentucky River Lock 14 at Heidelberg, Lee County during the KR255 race from July 2017.